Wrap each potato in foil. Bake 2 hours. Allow cooked potatoes to cool, but do not unwrap. Once cooled, place wrapped potatoes in refrigerator overnight. Unwrap and peel potatoes. Skin should come off easily. 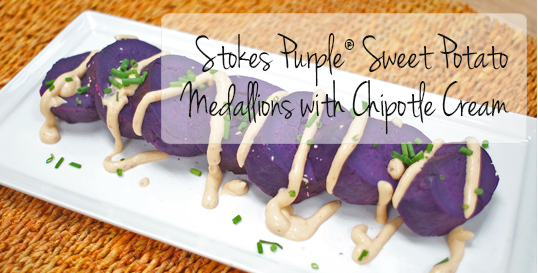 Slice potatoes into 1/2-inch medallions. To make chipotle cream, in blender container, combine sour cream, mustard, adobo sauce, chile, salt, and shallots. Blend until smooth. To serve, arrange potato slices slightly overlapping each other on platter. Drizzle chipotle cream over slices and sprinkle with chopped chives.